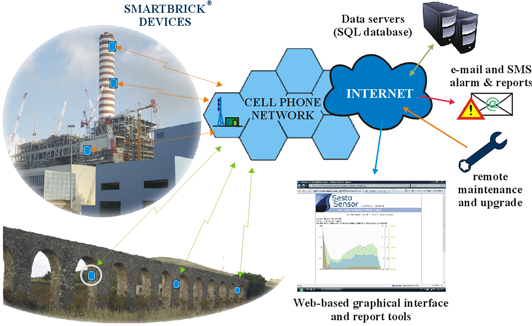 Smartbrick®: the self-sufficient Structural Health Monitoring Solution. 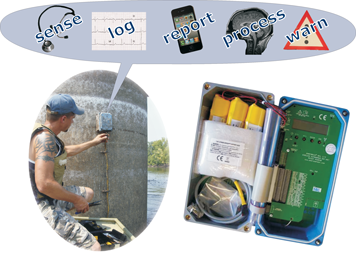 Conventional solutions for monitoring ground settlements and damages in buildings, bridges and tunnels have large hidden costs for design, system integration, installation and management. 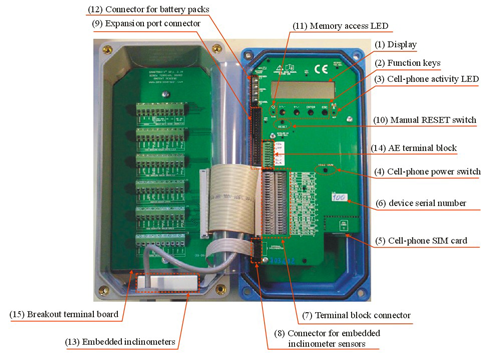 In addition to the embedded sensors, Smartbrick® has a wide range of multi-purpose inputs that can be configured for direct connection to additional sensors such as crack gauges, displacement sensors, strain gauges and load cells, as well as dedicated inputs for rechargeable battery, weather sensors, an external 2-axis inclinometer, a laser telemeter and even an "acoustic emission" (AE) crack detector. Smartbrick® can be programmed to send data through e-mail and FTP, has configurable warning thresholds for alarm SMS and email and can be remotely controlled though the internet or SMS messages to change configuration parameters or schedule specific operations. Whether your structural heritage requires a single sensor or a complex network, Smartbrick® is the right solution that can be tailored to your needs, to your budget and will remain flexible and open even to your future needs.